…from the 2010 Country Commercial Guide for Vietnam (U.S. Commercial Service). 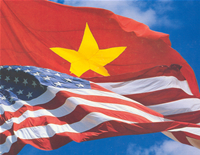 This 2.5 page document provides some very basic background information about this particular sector in Vietnam and one of the U.S.’ leading service sector exports. If you’re interested in reading the document in its entirety – all 148 pages of it – follow this link to the PDF version. Note: There are two mistakes on p. 2 of the excerpt, one of which I put in bold. First, Vietnam has far more than 20,000 students studying abroad. Perhaps the authors mean annually. (There are that many in Australia alone.) Total estimates range from 60,000 to 100,000. Secondly, Vietnam ranks 2nd (not 3rd) among sending countries for international students enrolled in U.S. community colleges – surpassing Japan and closing in on S. Korea.